Recently I was hooked up to shore power that had issues so I switched over to my generator. At one time the generator powered both roof air conditioners, but now it only runs one at a time, just like when I’m on a regular 30-amp service. Could it be something in the power system? Merle, I know you are aware, but I want to remind our other readers that your coach was factory-wired for two installed roof air conditioners, but because the shoreline cord is only rated for 30-amps, you are only able to run one roof A/C at a time. Remember each air conditioner must be on its own 20-amp circuit. There should also be a switch inside, (some are automatic, others manual), that allows you choose which air conditioner to run while plugged into shoreline. Running both units off the shoreline, as equipped from the factory, is mathematically and electrically not possible; hence the need for some type of switch. The generato r, however, adds another dynamic to the mix. It is rated to power both roof air conditioners at the same time…it has enough output capacity. Typically, the rear air conditioner is hard-wired directly to the generator output. 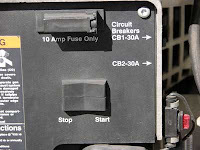 On or near the side of the control box on the generator, you’ll find two circuit breakers, one is wired directly to one of the roof A/Cs, and the other breaker is wired to the coach distribution panelboard which protects all the other 120-volt circuits in the coach, including the other A/C. 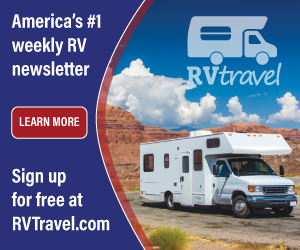 Chances are the circuit breaker on the generator itself is tripped or faulty. And there is the outside chance the air conditioner breaker in the panelboard distribution box is faulty.